Originally, I hadn’t meant to combine these two anime titles, then I realised I couldn’t give a full reference of one without the other. Sadly, I also could not honestly discuss the iniquities of one show without giving its counterpart praise, kind of like an Anime yin and yang. 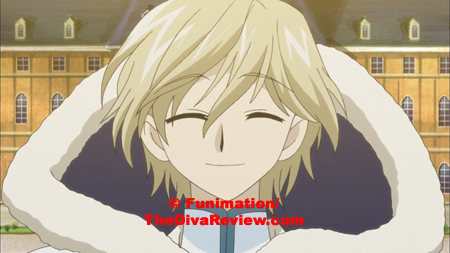 It might be cruel to compare Tsubasa Reservoir Chronicles to its sire (- dam?) the terrifically popular Card Captor Sakura, but it’s unavoidable and nobody ever accused me of being nice. In the days right before the giant Western Hoover sucked up any and all anime titles it could gobble up, the pickings were still pretty slim where US broadcast anime was concerned. Card Captor Sakura was the first series created by the incredibly successful all-female artisan conglomerate CLAMP that was shown regularly on North American network television. A sharp counterpoint to the male dominated cartoons of the WB’s Saturday morning lineup, CCS was one of the greatest of the magical girl genre. The eponymous Sakura was a sweet, elementary school girl who unwittingly releases a deck of powerful cards that hold the keys to the earth’s elements, (- wind, rain fire, flower, etc. ), that if left untended, will destroy the world. She is talked into retrieving the cards by the deck’s lax guardian, a stuffed animal looking thing, called Keroberos. Kero-chan coaches Sakura in the fine art of card capturing and she is cheered on and protected by her devoted friends and family. 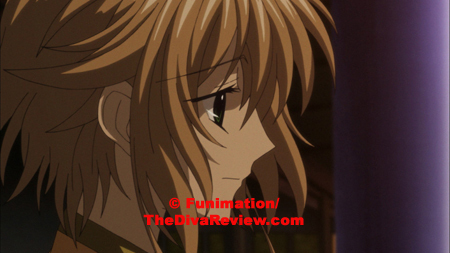 Frightened and unsure at first, as the series progresses, we watch Sakura grow into a strong, smart fighter who bravely risks her life repeatedly to get the cards back. Beautifully drawn (- As per usual from CLAMP) and building to a thrilling crescendo, Card Captor Sakura ran for sixty-four episodes and two feature films and many were sad to see it go. 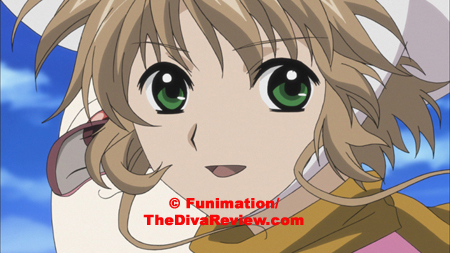 People were so sad that CLAMP decided to resurrect dear little Sakura in an alternate universe and call the series Tsubasa Reservoir Chronicles (- Don’t ask me, I dunno). This time the characters are the same, but in very different roles. 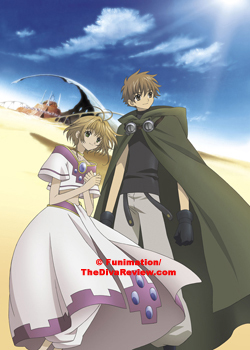 Whereas Card Captor Sakura took place in present-day Japan, the world in which Tsubasa’s Sakura resides is something of pure CLAMP imagination: Could be the future or the past, might be earth, but maybe not. The alternate worlds and dimensions are a huge part of the show. 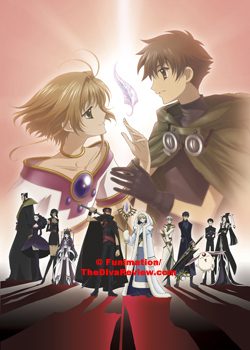 In this world, Sakura is a princess living happily in her brother’s kingdom and quietly adored by her friend, commoner Li Syaoran. Sakura isn’t aware that she’s possessed of a magic much coveted by unseen evil forces. Those forces are able to bring her power forth in the form of two wings on her back. 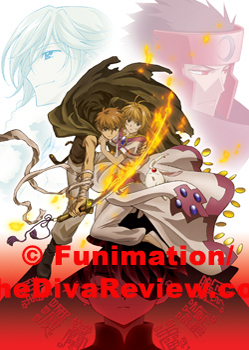 In his attempt to free Sakura from capture, Syaoran accidentally scatters the wings, which leaves Sakura a shell of herself without any of her memories. 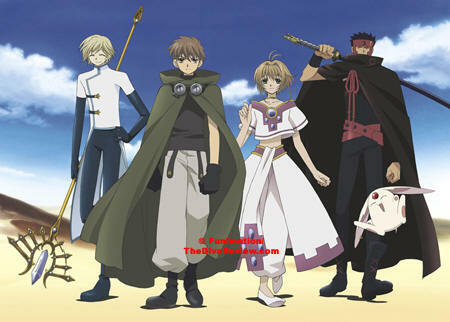 Syaoran now has to gather the wings to make Sakura whole again. Is this last bit sounding familiar? 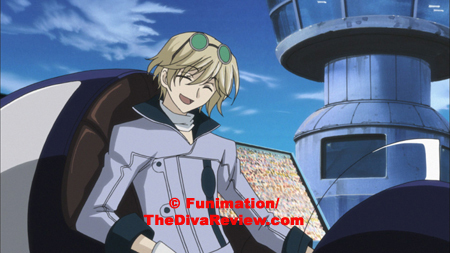 There’s a lot of familiar in Tsubasa Reservoir Chronicles. A lot of the series feels like either a love letter from CLAMP to their huge die-hard following, or a really pathetic double-dip. 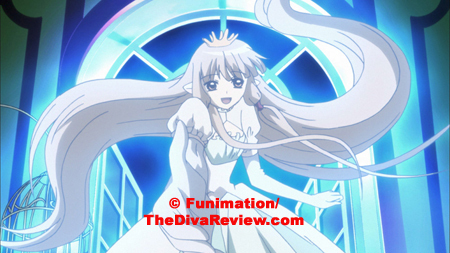 Many characters and references from other CLAMP projects are constantly laced throughout Tsubasa. Of course, nearly all the inhabitants of Card Captor Sakura are present; although the device is that they are not the same people we watched in the original series. 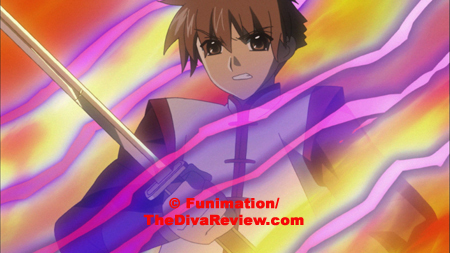 This is the big problem with Tsubasa Reservoir Chronicles. They’ve taken away the spunky little girl who endeared herself to viewers through her courage and good heart and replaced her with a waffling, worthless weakling. Tsubasa Reservoir Chronicles shows us a lobotomised wuss of a girl too inept and frail to anything but smile and babble about dreams. I felt like I was watching a character from the 1970’s in the years pre-Sailor Moon, heck, pre-Princess from Battle of the Planets! Tsubasa’s Sakura is good for nothing except to model various princess and maid outfits and be rescued. I understand that in the first episodes she wasn’t up to snuff with all her feathers missing (- Feathers clearly equal marbles in Sakura’s dimension), but after fifty-two episodes, it would be nice if she was an actual participant in her own rescue instead of leaving everything to the three men who accompany her. Li Syaoran is still with us from Card Captor Sakura, and unlike Sakura he appears to be a little older than his original primary school incarnation. There are two yaoirific new characters from alternate universes recruited to help the two kids, a lovely blonde wizard called Fai D. Flourite (- Yeah, I know, but it actually suits his wispy character) and Kurogane, a fierce warrior banished from his world by his queen until he learns to calm down. They also have one of the most irritating creatures ever seen in anime; a whining, babbling beanbag with big feet and silly ears called Mokona, who is supposed to be the radar for Sakura’s feathers, as well as the traveler’s mystical mode of transportation through dimensions, but all the incompetent, baby-talking thing really is is a blatant attempt at merchandising. The only way you’d see me run out to buy a Mokona doll is if I bought a shotgun to go with it. So not cute. 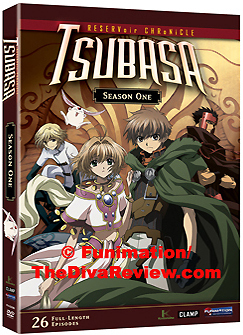 What’s even worse about Tsubasa is how terribly boring it is. The group wanders from world to world and if they’re lucky, that obnoxious white pillow hasn’t led them to the wrong place. Once they land somewhere, they have no clear idea where to look and have to depend on Mokona getting a reading, which often the little gremlin will be sleeping through and thereby miss the opportunity to quickly move onto the next world and the next feather. Nothing in Tsubasa Reservoir Chronicles is done fast; every adventure in a new place moves at a glacial place, with the four needing to adapt and learn the ways and means of each new world, only to never use it again once they move on. Most of their visits take at least four episodes before a single feather is obtained, which is just painful. I don’t really want to see them being goody-goody’s to random people at the loss of their quest. The big scam is that there’s no way of telling how many freakin’ feathers they need to collect. Ostensibly, this could go on forever! I’ve come to realise I need rules in my anime. I’d like a structure; tell me when I can expect to the end of this series and give me exciting stuff to watch until we get there. The other scam is I’ve reached the end of the series and the story’s big bad has gotten up out of his chair once. This shady character is so boring that he just lounges through every show talking about some evil thing he’s gonna do to the group sometime, but we are never told what it is or why. Great, they have an enemy for no reason! The monocled villain is also a master of ESP because everything the team does that unbeknownst to them screws with the bad guy’s grand scheme is always something he predicted. ‘Oh, see Sakura stub her toe? Hey, Kurogane’s picking his teeth. Wow, Fai ate a Big Mac. Don’t worry, I planned for it all. It’s all going exactly as I predicted’. Absolutely ridiculous. xxxHolic is another anime title from the ladies of CLAMP. 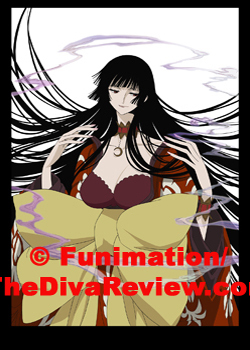 Marginally related, xxxHolic is a spinoff featuring Yuuko, the Witch of Time and Space, one of the featured characters of Tsubasa Reservoir Chronicles. Kimihiro Watanuki has a little problem: The high-strung high schooler can’t walk down the street without being set upon by the dead. Ghost and other spirits are attracted to Watanuki like raccoons to a trash can; the onslaught of too many aggressive spirits nearly chokes the life out of the unfortunate boy and he literally must flee for his life from things no one else can see. The chase leads him to the front gate of a house that won’t materialise to anyone who doesn’t need to enter. Living inside that house is our heroine (- of sorts) who claims she can rid Watanuki of his evil spirits for a price, before he can agree or run screaming from the voluptuous weirdo, the deed is done and now Watanuki owes a debt. The witch takes a slave, making the high schooler cook, clean and perform household chores for Yuuko, her two strange childlike assistants and her best friend, a pudgy little creature called Mokona. Aha! “Stop right there,” you say, “I thought you hated Mokona?” I loathe Tsubasa Reservoir Chronicles’ white Mokona with a passion unbridled; the Mokona in xxxHolic is a different one, black in colour and entirely more bearable in attitude. Like its pal, Yuuko, this Mokona enjoys eating to excess and drinking even more and unlike its paler counterpart, actually seems good for something. Watanuki plays an unwilling slave day in and day out with no idea how long he must work before his debt is paid, while Yuuko plies her trade, seeing abstract bits of the future and solving problems for a select few customers who all have to pay a non-monetary price for her aid. This is where xxxHolic drags; many of the volumes of this short series, like Tsubasa Reservoir Chronicles, are devoted to helping random characters. It’s only very gradually that you realise that there’s something quite a bit more to Watanuki than meets the eye, even beyond being a ghost magnet. 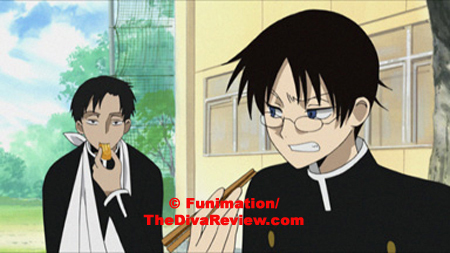 A pair of schoolmate friends, Watanuki’s crush Himawari and the preternaturally sedate Doumeki, who inadvertently drives Watanuki mad with jealousy, eventually seem to be affected by whatever it is that is drawing supernatural phenomena to him. Little by little we meet rain sprites, vestal sprites and the air-surfboard riding yakuza tengu who protect them. There’s also a deceptively tiny pipe fox spirit that protects Watanuki as the spirit world comes closer and closer to the hapless student. Sadly for viewers, we never find out why this is all happening to Watanuki, or what the end of all this trouble is. Just as xxxHolic ups the ante and devotes itself to Watanuki’s story, it’s over. All one can hope for is that a continuation of the series will give us what we signed up for in the first place. xxxHolic is a very different looking CLAMP offering. 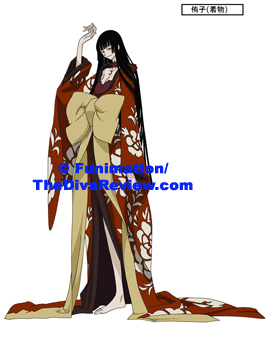 Artistically more daring than any of their other projects, xxxHolic’s designs are a beautiful, baroque mix of genres styles. 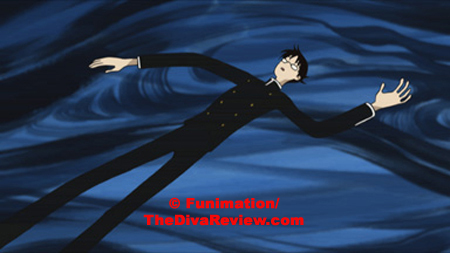 Watanuki is a bizarre-looking thing by CLAMP standards, all long, straight, thin lines and insanely out of proportion. Rather on purpose he’s like a stick figure or paper doll in contrast to the rich, typically CLAMP-esque sumptuousness of the way Yuuko and her home are drawn. The blend of the two are unexpectedly hypnotic and do a lot toward getting the viewer past the dry narrative of those chapters that have nothing to do with Watanuki. The backgrounds whenever Watanuki winds up in the spirit world also go strangely flat. It would be easy to discount those designs as a lessening of the great CLAMP’s legendary aesthetic standard, but there’s so much work, colour and thought behind these ideas that it’s obvious this is more a demonstration of CLAMP maturing and getting better rather than leaning back. 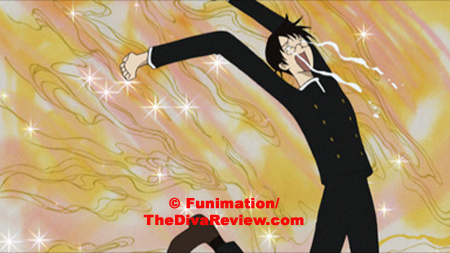 The other brilliant thing about xxxHolic is the fact that it’s a hoot. Silly and completely unselfconscious, xxxHolic’s scripts display a wit that works on many levels and keeps those slower patches in the narrative from becoming too wearing. The transfers for both titles are immaculate. Having no patience for the dubbed versions, I’m very pleased with the subtitling. My only gripe about Funimation’s subs is that for any fansub I’ve ever seen, the fansubbers normally take the time out to do a small explanation of terminology English-speaking audiences may be unaware of. With xxxHolic in particular, there are many cultural references that are going to be plain old lost on non-Japanese folks. Still, unlike other distributors, at least those references remain and aren’t homogenised down to nonsense phrases. 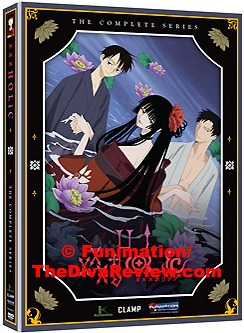 Also, I wish on their new DVD box set for xxxHolic, some extras had been included, but the inset art is pretty sweet. I don’t know if either of these ended series will make it back into production and with Tsubasa Reservoir Chronicles, I couldn’t care less. 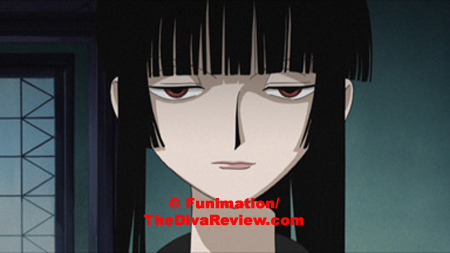 The beautiful, hilarious and hypnotic xxxHolic, however, I would love to see more of and soon.